20 April 2016, 10:58 a.m.
Neven Botica knows Astara could be just the ammunition he needs to promote her sire Dalghar and he doesn’t want to part with her. The prominent Perth businessman owns both Astara and Dalghar, who stands at Brighthill Farm in Tauwhare, on the outskirts of Hamilton. Botica bought Dalghar from the Aga Khan and raced him from Andrew Balding’s Kingsclere Stables in England then stood him at stud for a season in France before sending him to Brighthill Farm. Dalghar sired three winners from a handful of starters from his sole Northern Hemisphere crop and Astara credited him with his first New Zealand success when she won at Ellerslie earlier this month. The bloodstock agents were on the phone after Astara’s win, but Botica wouldn’t relent. “There were offers to buy her straight after that race, but Neven wants to promote his stallion,” said co-trainer Donna Logan. “He knows she can do a good job promoting him. Vapour Trail won the Gr.1 NZ Oaks and went on to be the 2001-02 NZ Bloodstock Filly Of The Year, while Good Faith broke down when winning the 1997 Gr.1 Ellerslie Sires’ Produce Stakes. 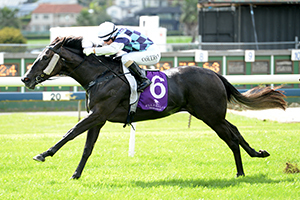 Astara gets her opportunity to be a black type winner on Saturday when she contests the Listed Champagne Stakes at Ellerslie and on the strength of her form she is the horse to beat. She showed promise at trials and had a busy time during February after winning at the Avondale trials early in the month. Fifteen days later she made her debut at Te Aroha and fought hard when second to Midnight Gossip then 10 days on she was at Matamata, where she finished a handy fourth to Gold Rush in the Gr.2 Matamata Breeders’ Stakes. Sam Collett has been aboard Astara in all bar one of her public appearances and will be in the saddle again on Saturday. “Sam knows her so well and she really likes her,” said Logan. “I’m not sure what we’ll do after this race. She’s going to make a nice three-year-old with a bit of strengthening and maturity on her side. Logan and training partner, Chris Gibbs, will be represented in two of the features at Ellerslie on Saturday as Candle In The Wind is entered for the Gr.1 Manco Easter Stakes. A winner of six races, Candle In The Wind gets in on the 53kg minimum under the set weights and penalties conditions and will be tackling successive Group Ones, having finished seventh in the NZ Thoroughbred Breeders Stakes at Te Aroha last start.